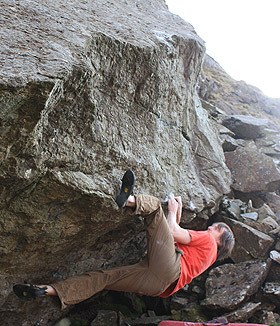 Last night Si Panton revisited the Summer Teeth Boulder beneath Dinas Mot in the Llanberis Pass and climbed an intense new problem. Bag of Sticks V8/7B Starts sitting as per Summer Teeth with both hands matched on the curving finger rail just below the lip. A series of increasingly desperate moves leads left along the lip until it is possible to rock up to the block hold in the middle of the face and finish as for Summer Telse. “I had a quick look at this a few years ago when the first problems were done, but dismissed it as being too hard. A few weeks back it popped into my head again and I decided to go and have another look. The holds on the lip are pretty poor, but to my surprise I managed to work out a useable sequence in sections. Feeling pretty pleased that I’d cracked the code, I pulled back on at the start to check a foot sequence and one of the key footholds broke clean off. I then spent over an hour trying to find a new method that didn’t use the foothold, but in the end realised that I’d ruined the problem. I was sure that somebody could do it without the foothold but that it would be a very unbalanced problem. It didn't take long to make the decision: I took the shield of departed rock home with me and returned the next day to glue it back in place. A week later I came back and tried the problem again. This time my original sequence felt really tenuous, so much so that I doubted I could piece it all together. All was not lost though, after much experimentation I cracked another much better sequence. Darkness had descended by then so another visit was required. Sunday evening, with a perfect drying breeze channelling down the Pass, I returned and after a brief familiarisation with the finish, pulled on and nailed it first go: happy man! The grade is a guess; there are several different possible methods so I would imagine that opinions will vary quite a bit.” explained Si. This is a great addition to an already top quality boulder. The existing problems are reason enough top make the trek up the hill from the Barrel. Summer Teeth is a very funky and involved affair with an unobvious sequence and some very slopey holds. Summer Telse is a wild and gymnastic number and probably worth V7/7A+. To view a topo showing the lines of the problems click here. The boulder is located directly below the right hand descent gully on the Nose on Dinas Mot. Approach via the main crag path and traverse across right just before the crag is reached.